Click on the link for the current Llewellyn Castings Pricelist. 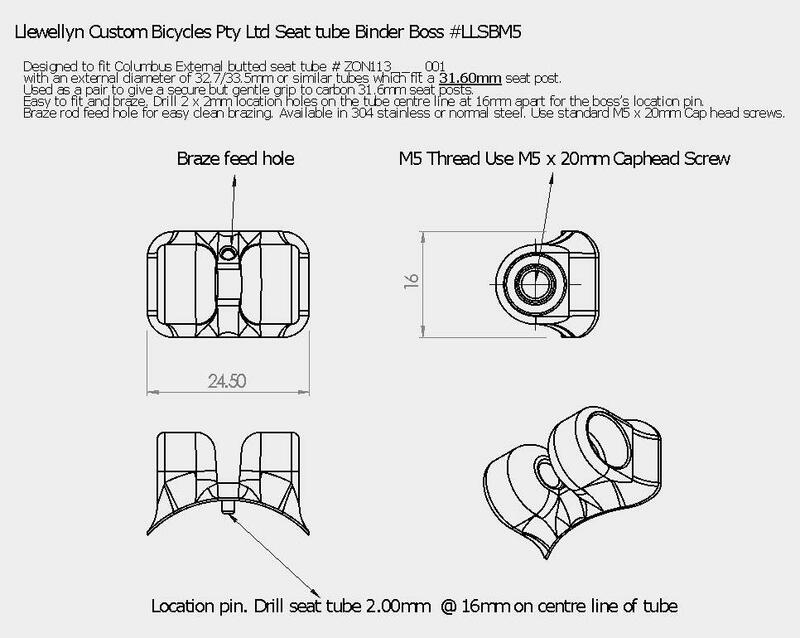 New things include Rack Bosses and Seat Tube Binder Bosses. Why do I design and produce my frame castings and parts when there is a fair amount on the market for a frame builder to choose from? Much of the available castings are from the 80’s and early 90’s era when steel frame production was ubiquitous. Since then, steel frame tubes and bicycle frame components have changed and this has effects on our frame design. As I work at the bench making frames I find a lot of existing parts are not frame builder friendly, the part might be missing features, or lacking versatility, or may not lend itself to easy modification, or restrict the frame builder’s design and aesthetic considerations, or it might be simply time-costly to use. These limitations motivate me to design and produce parts that have never existed before for us frame builders to use. These new part designs allow me (and other builders) to construct frames with the best of the time honoured and proven lugged frame construction methods with the merits of contemporary design. I strive to ensure the Llewellyn frame castings and parts improve the building experience and add features that belong on high quality bespoke steel frames in the 21 st Century.